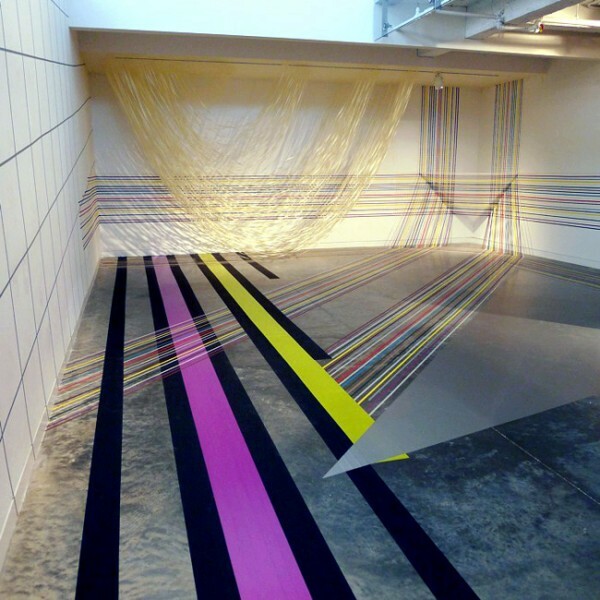 “Ward’s site-specific works are intricate and thoughtfully planned geometric installations applied to an interior in a way that comments on the site’s architecture. Ward’s signature medium is tape — be it electrical tape, duct tape or masking tape. 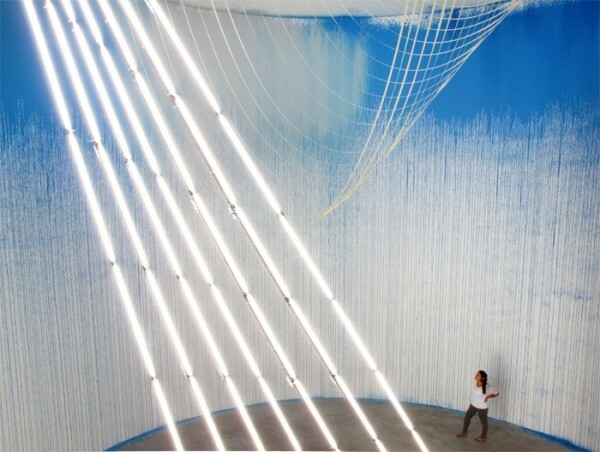 Through this medium she explores the unique structures of the sites in which her installations are situated. Ward’s installation embraces all aspects of the gallery space, utilizing the intimate nooks between columns and walls that might otherwise go unnoticed. She has taken the most basic art element, the humble line, and lifted it into three dimensions. She allows a framework of lines to move intently through the gallery, making sharp angles to continue purposely along their path. The gallery columns are now clothed with bright red and yellow stripes, transforming both line and space. 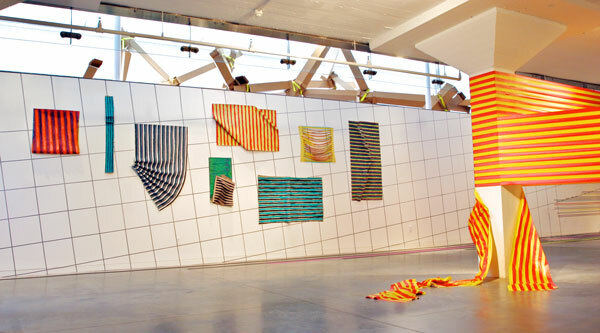 Ward created a colorful gallery that is immediately playful with its circuslike stripes and dizzying grids. Further consideration reveals a deliberate plan and underlying structure to the works. The linear compositions are a picture of control and tension. Weight, stickiness and span are all carefully considered. Even slack loops suspended from the ceiling exude tension, their exposed adhesive threatening to bond with anything given the chance. Process oriented, Ward’s fascination with her materials shows through her unapologetic display of their inherent qualities. She lets tape be sticky, canvas be wrinkly. Careful execution coupled with chaos, the works are still an exercise in chance. A beautiful contradiction to all this tension and stickiness is the works’ impermanence. 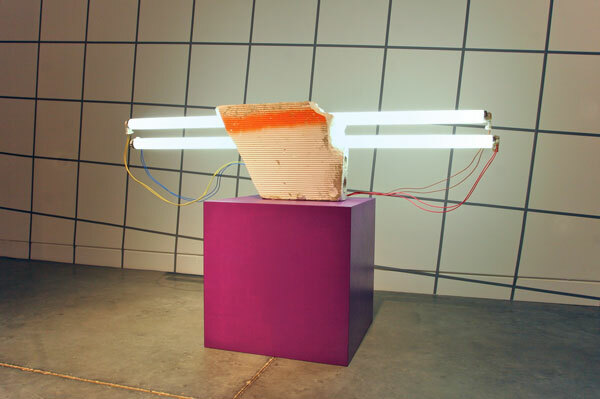 Ward’s site-specific artworks are designed to be temporary. Working in this manner allows Ward to remain unattached, to let go of a perceived preciousness of artwork. The entry 'Rebecca Ward' was posted on April 29th, 2012 at 8:22 pm	and last modified on April 29th, 2012 at 8:22 pm, and is filed under Uncategorized. You can follow any responses to this entry through the RSS 2.0 feed. Both comments and pings are currently closed.